This week’s Once A Book project comes from the blog Atypical Type A by Alicia Parsons. When Ms. Parsons was planning her literary themed wedding, she turned old books into these unique vases for decoration. There’s so much I love about that whole idea, starting with the literary themed wedding. Fabulous! Her tutorial, Make a vintage book vase, is easy to follow, requires only basic craft supplies, and makes a vase that is lovely to look at, but it is just for looks. To make a vase that holds water and a stem or two, use a book with a spine wide enough to wrap around a small test tube or florist water tube. Insert the tube before adhering the end pages in step 6. As always, with Once A Book projects, if you try it, send a picture and I’ll post it here. Resources: Once A Book, Atypical Type A, The Daily Post. How many phone books do you get a year? When we moved into this house there were eight gigantic phone books and four small ones sitting on a closet shelf. The shelf was sagging under the weight. Two days after our phone service was turned on, another two or three books were delivered. I don’t know about you, but I haven’t used a phone book in years. Everything’s online! Maybe it’s time for those businesses trying to make a buck with their version of the Yellow Pages to rethink their business model. Enough with the dead trees already. On the positive side, phone books don’t have to be a complete waste. Like any other book, they can be modified into something useful and fun. This week’s Once A Book project turns an old phone book into a pen and pencil holder. Chica at the ChicaAndJo.com, posted this tutorial on how to Recycle a phone book into a pen organizer. The tutorial has photos to help with the process, and although there are a lot of steps, it seems straight forward. It’s a great way to do something useful with these dinosaurs, but if you’re feeling more ambitious (and have a lot of phone books), here’s an option. Joking aside, the phone books are not just a nuisance in the closet. They use too many resources: paper, ink, gas for delivery, for something that most people toss directly into recycling, or worse, the trash. To stop delivery, visit Yellow Pages Go Green. Resources: Once A Book, ChicaAndJo.com, Yellow Pages Go Green, The Daily Post. Most of the Once A Book projects I’ve posted so far involve removing some or all of the inside pages of an old book. I know that is tantamount to heresy for some, but maybe I can redeem myself a little bit with today’s project. Book beads from the smallest forest takes recycling a step further by putting those sad old pages back into circulation. They’re called “book beads” because the process is the same as the binding process used to make children’s board books. You don’t have to use book pages, though. Any type of paper will work, but book pages are especially fitting because the “pages” flip, like a tiny round book. The beautifully photographed step by step tutorial can be found by clicking quick tutorial : : book beads. Don’t bother looking for the written instructions, it’s such an easy process, the photos tell the whole story. As always, if you decide to make this project, send pictures and I’ll post them here. 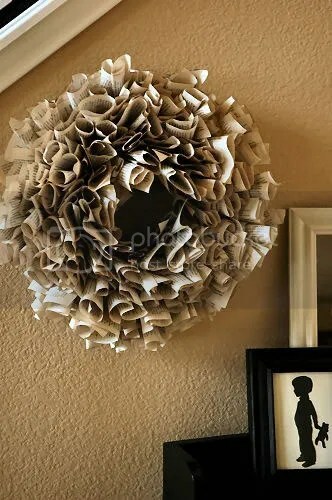 In case you don’t have enough books on your bookshelves, there aren’t enough books stacked on your night stand, piled next to the couch, or teetering on the coffee table, here is another way to bring books into your home. This Once A Book project from the bloggers at FactoryDirectCraft.com is a quick project that will take about an hour from start to finish. Use any book you like. Heavier books can be propped on a table, lighter ones can be hung. A drill or an awl is helpful but not necessary. 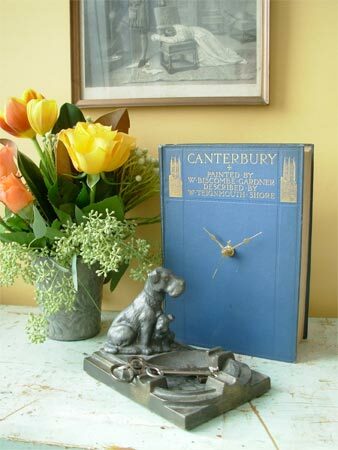 The tutorial can be found here: Upcycling – Turn an Old Book into a Working Clock. If you make a book clock, send me a picture, and I’ll post it here.